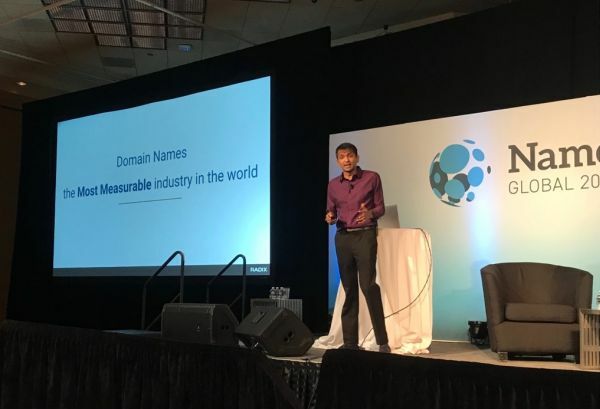 On Day 2 of Namescon 2019, Bhavin Turakhia, the founder of Radix, Flock, and Zeta, took the stage to give a phenomenal keynote speech about his journey from a founder to a billionaire and his experience in the domains industry. The two-part presentation was followed by a fireside chat with Soeren von Varchmin, the CEO of NamesCon. At Radix, we have a fundamental belief: You cannot improve what you don’t measure. At NamesCon 2019, Bhavin Turakhia spoke about the impact of this very belief on the overall success of Radix. In his keynote address, Bhavin highlighted the importance of data tracking at Radix for driving decisions big and small. Constantly looking at the scoreboard is how Radix keeps a check on the health and growth of the business. That the Domain Names industry is the most measurable industry in the world only enables data tracking at Radix a lot more comprehensive. That the Domain Names industry is the most measurable industry in the world only enables data tracking at Radix a lot more comprehensive. China plays an interesting role when it comes to domain new adds across the industry. In 2017, 44% of all domain names registered on nTLDs came from China. That’s a significant contribution, one that can’t be ignored, but drilling down on these numbers indicates that only 27% of overall renewals come from China. Given that names in China sell for a much lower price than the rest of the world, the renewal contribution, for Radix, was only 9% from China. So, registrations coming in from China are not the true representation of the global market share of an nTLD and, therefore, it’s crucial to measure Non-China New Adds as an indicator of TLD success. Radix values first year renewals over registrations. In fact, Radix goals are renewals focused and basis that the team works towards the number of new registrations to go after in the given year. The registries’ market share of first-time renewals is also an indicator of the quality of domains under management by those registries. Every single marketing decision at Radix is numerically justified. This means to prove that the cost per acquisition (CPA) is lesser than the lifetime value of the customer (LTVC) in the proposed marketing activity. This is a fundamental business principle that is followed at Radix. As a consequence, the business is fine with spending money in the first year if it has been proven, with evidence, that the money thus spent would be recovered and will yield a positive RoI in the subsequent years. For Radix, it’s not just enough that domain names get registered on its TLDs. The focus is on the developed websites on the TLDs. That is the true measure of the nTLD success – usage by customers. Therefore, specific end-customer initiatives are undertaken at Radix to increase the usage of domain names on its TLDs. While these are the four fundamental success metrics followed and measured at Radix, they are not the only reason behind the growth of the business. Radix takes a detail-oriented and scientific approach towards making every decision, and that has been instrumental in generating success. At the same time, the credit goes to the team at Radix, that has done a great job towards building a methodical approach in the way it functions at every level.